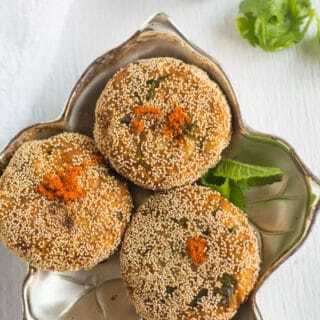 How to make Paneer Cutlet described here with step by step pictures. These are very easy to make and perfect for tea time snacks. Would be a great appetizer for party and functions. Large batches can be made for parties without spending much time in front of the stove. Does not need any exclusive or fancy side dishes to be served with. Just ketchup will be the great side dish to be paired up with. Cutlets are popular because of its texture and flavor. 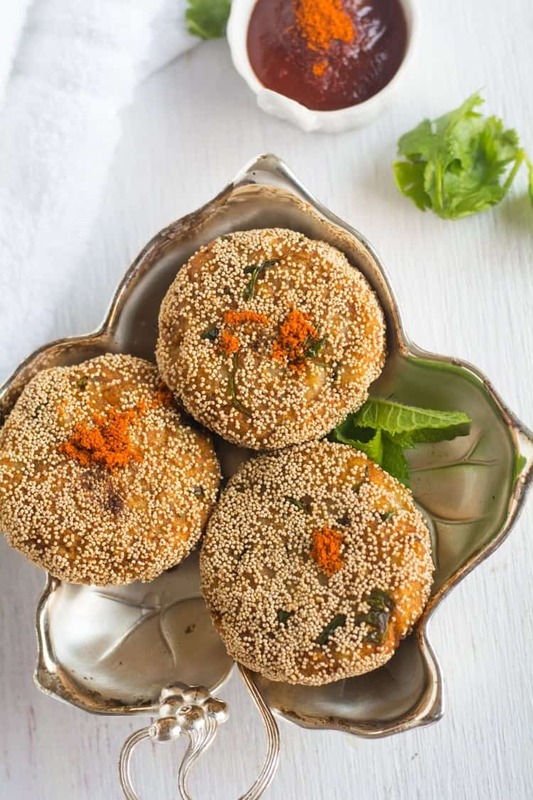 These Paneer cutlets are also crisp outside and soft and moist inside. Just melts in your mouth, Yummy it was. I’m writing this post around in 3 in the afternoon, making me feel really tempting and mouthwatering. Blaming myself, that I should have saved few to munch on today. What is Paneer? Paneer is homemade cottage cheese. Many of us make it at home, and stores also carry a good quality paneer. You may use either one of them. Substitutions for Panner? Ricotta cheese or cottage cheese would be a perfect substitution. And they are available in most of the grocery stores. If you are searching for other cutlet recipes, then look into Corn Cutlet, Bread Cutlet, Potato Peas Cutlet, Sago Cutlet. If you are planning to make this paneer cutlet recipe, you may boil the potatoes in advance and can be the refrigerator. Refrigerated boiled potatoes stay good for about 4-5 days if stored in airtight containers. 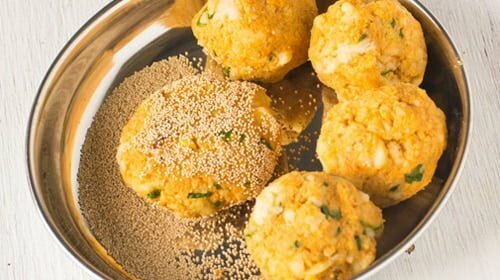 If the paneer is homemade, you may also make it well in advance and store in air container in the refrigerator. But deep fry the cutlets just a few hours before serving. This avoids it becoming soggy after a while. It does taste great if it is served hot. If you are calorie conscious and are avoiding deep fried food, then shallow fry them in the heavy bottomed pan. Use the non-stick pan for shallow frying to minimize the oil consumption. 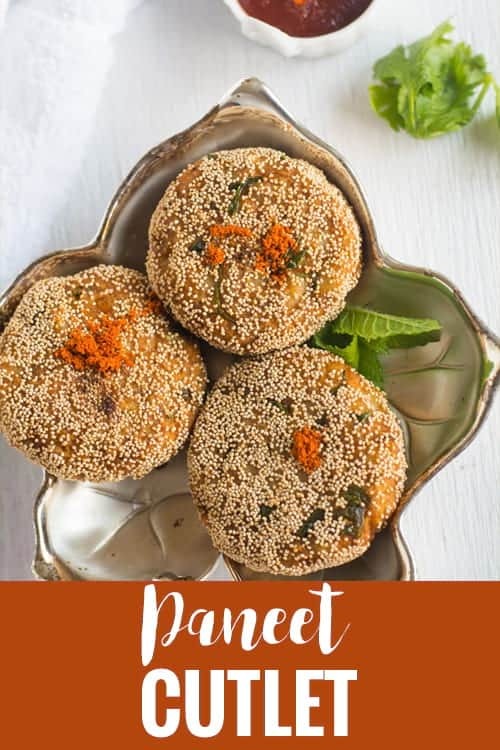 I have listed only the basic ingredients for making paneer cutlets. You may also use grated carrots, cauliflower, beets as other ingredients. If you want the less spicy version, reduce the number of chilies and the chili powder in the ingredient’s list. Grate paneer finely. Alternatively, use blender/mixer for grating. Add paneer chunks to the mixer jar. Pulse the machine for few seconds until it crushed up finely. In a mixing bowl, mash the potatoes until no big lumps seen. 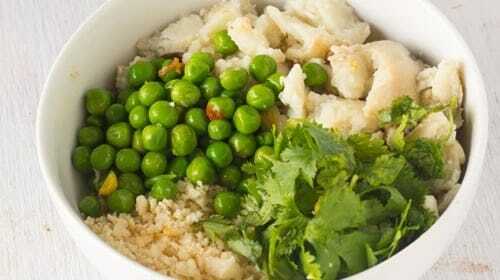 Add grated paneer, green peas, chopped green chilies, chopped coriander leaves, chili powder, and salt. Combine them well, and make it into small sized balls. Then pat them on the flat circle shaped patties. In a small plate add poppy seeds. Place each patty over the poppy seeds and gently press them until they get coated evenly. In medium flame, heat cooking oil in a pan. Add these patties gently and fry them until they become golden brown on all the sides. Transfer fried paneer cutlets to the kitchen towel to remove any excess oil and serve hot with ketchup or green chutney. 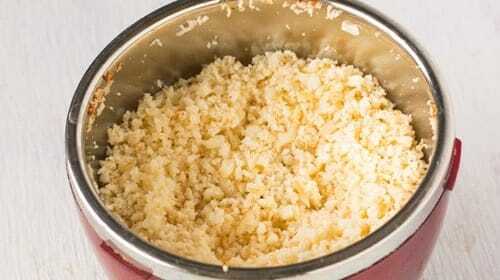 Learn how to make paneer Cutlet recipe with step by step pictures. 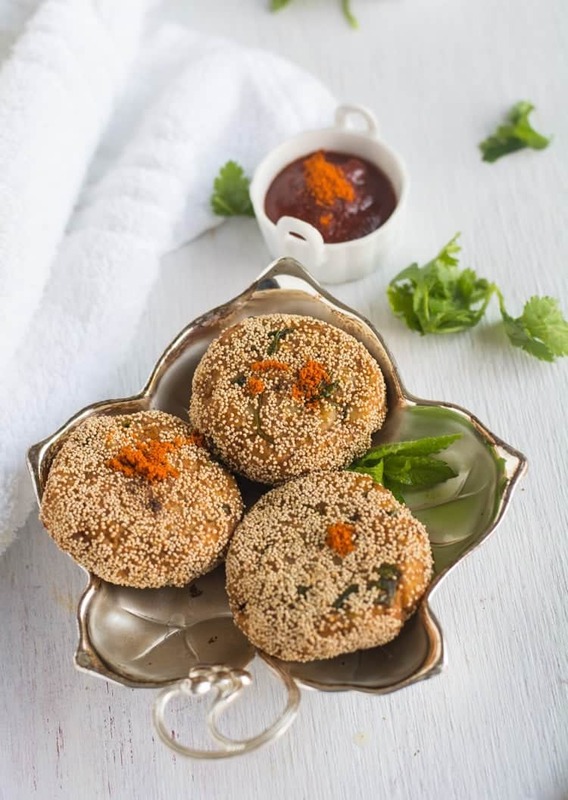 This crispy tikki is made with paneer/cottage cheese and potatoes, a perfect snack for tea time. Would be a great appetizer for the crowd. Grate panner finely. Alternatively, use blender/mixer for grating. Add paneer chunks to the mixer jar. Pulse the machine for few seconds until it crushed up finely. In a mixing bowl, mash the potatoes until no big lumps seen. Add grated paneer, green peas, chopped green chilies, chopped coriander leaves, chili powder and salt. Combine them well, and make it into small sized balls. Then pat them into flat circle shaped patties. In a small plate add poppy seeds. Place each patties over the poppy seeds and gently press them until they get coated evenly. In medium flame, heat cooking oil in a pan. Add these patties gently and fry them until they becomes golden brown on all the sides. Transfer fried cutlets to a kitchen towel to remove any excess oil and serve Paneer Cutlets hot with ketchup or green chutney. Mmm I love paneer, will definitely give this a try. Thanks for the tip on chilling the potatoes! Yeah! same here. Homemade Paneer is a healthy alternative for store bought cheeses. What a lovely and well done post. I remember eating these during my times in Raipur. Every evening after returning from work, we were meet by our cook and presented with a plate of Paneer cutlets. They were a great snack with a cold beer as well. Thanks for the memory and post. It’s difficult to find Paneer here where I live in Sweden. Is it hard to make Paneer at home? Thank you Ron for making me remind my evenings in India. Our evenings are filled with this kind of spicy snacks. Making paneer at home is easier, and just need milk and vinegar/lemon juice for the preparation. Soon I will come up with a detailed post for making paneer.